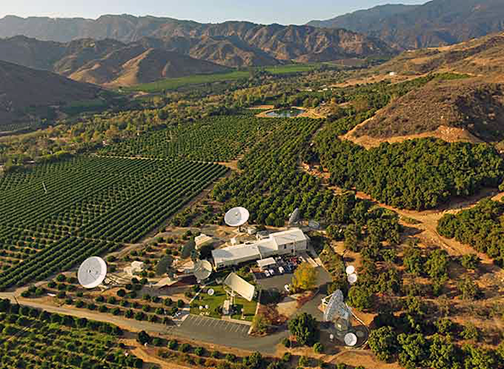 The World Teleport Association (WTA) has announced that COMSAT has achieved provisional certification of their Santa Paula (California) and Southbury (Connecticut) under WTA’s Teleport Certification Program — further certification of Speedcast teleports globally will be forthcoming. Since its introduction at IBC 2015, the Certification program has quickly grown in popularity, with 16 teleports currently engaged in the quality evaluation process and certifications already issued to teleports owned by Eutelsat, du, Signalhorn, Optus, Globecomm, Media Broadcast Satellite, Horizon, Elara Comunicaciones, GlobalSat, Talia, Telenor, Speedcast, Batelco, Planetcast, VIVACOM, Etisalat, Intelsat, Hawaii Pacific Teleport, SingTel, Cyta and Arqiva. COMSAT's Santa Paul teleport facility. Photo is courtesy of the company. To achieve Provisional Certification, a teleport operator completes a +170-item questionnaire and submits it to WTA. The Association analyzes the data based on standards established by its Certification Committee and issues the Provisional Certification based on the self-reported information. The teleport then has six months to achieve Full Certification. To achieve Full Certification under WTA’s program, an auditor is dispatched to visit the teleport, provide independent validation of the data submitted in the questionnaire and identify additional factors that may positively or negatively affect the score. Full Certification is issued at a Tier number from 1 through 4, of which 4 represents the highest degree of excellence, and remains in effect for 3 years. President David Greenhill stated that COMSAT brings more than 50 years of experience in the Satellite Earth Station and Teleport industry during which the company has demonstrated high availability and premium quality of service as well as on-schedule performance. The Santa Paula teleport is located 90 miles north of Los Angeles and the Southbury teleport is located about 60 miles north of New York City. Each teleport has operated continuously for more than 40 years and both were built to high standards for providing life and safety services, along with a host of satellite system platforms from metrological data gathering to advanced navigation systems. WTA Executive Director Robert Bell added that certification supplies the crucial missing answer to the teleport customer’s biggest question: what quality of service will I really receive?” Independent, standards-based evaluation and validation sets teleport operators apart and assures customers that they will receive the price-performance outcome they expect. WTA’s Teleport Certification Program serves both teleport operators and their customers by creating an objective, transparent, and internationally accepted method for teleport operators to document the quality of their operations for customers and strategic partners. The certification also provides a means for customers to select teleport vendors delivering the price-performance level that is appropriate for their applications. Select this direct link for a list of WTA certified teleports.